The F2/F3 has a horribly useless headlight. 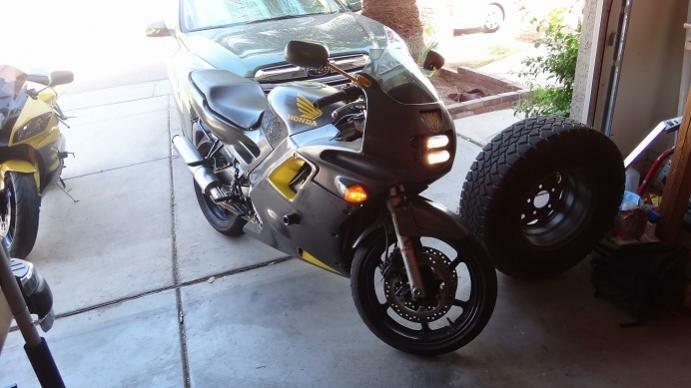 It is scary as hell cruising down a dark street with the stock light, almost makes you ride less than the speed limit. I decided to build my own headlight assembly using two fog lights from AutoZone. I bought the Navigator Cyber White part# NV-260B. The lights look pretty slick were reasonably priced. They are actually a yellow tint which goes perfect with my paint too and gives good contrast at night tho many would argue white is always better. No matter what, a flashlight is almost better than the stock setup. I used various pieces of hardware to build out the custom bracket/mount that is fully adjustable left/right/up/down/diagonal and the lights themselves are adjustable separately up and down after setting the bracket. I even used rubber grommets to dampen some of the vibration and keep things stable. I did have to cut every single piece in some way to make it work, but hey that's custom! I have an on/off switch for the whole light now as well mounted on the dash. Unnecessary except for track but a feature still. I wired it up so one light is on for lo beam, and both lights are on for high beam. With the fog lights wide angle the single light gives adequate riding light on a semi lit road. On a totally dark road the secondary light aims lower to cover the gap the low beam light misses (much like the stock headlight did). This now gives complete coverage for light and gives a good safety margin so I have less of a chance to "ride ahead of my lights". A pipe style clamp with a boxed end that is opposite of the screw/clamp side, but has enough space to include a nut to spin freely. I found this at a nut/bolt specialty shop including the beam style clamps. -The beam clamps go on the lower bars of the dash mount bracket that's attached to the steering head/frame. -Measure how far from the bracket to the front of the cowl is and then cut the threaded rod so it will not stick out far enough. You have plenty of room to thread the rod into the bracket so room for mistakes on length. -The pipe clamps go on the upper bars however I drilled a bit bigger than 3/8 hole into the boxed end. The idea is to put the threaded rod through, and thread into a nut. You JB weld the nut onto the rod and the nut/rod should spin freely inside. This is how you adjust the upper tilt/left/right/diagonal. -The grommets go inside the eyelets. This is hard but possible. Once inside you can use the 3/8in threaded rod to thread into the grommet and it is stiff enough to not need a backing nut. -I cut on of the top parts of the T so it's like an L now, long in the center, short at the top part that sticks out. -Next combine the L and T bracket for each side. The top of the L goes to the bottom of the T which is now an L after you cut it. It should now look more like an E with the bottom third bar of the E cut off, and the center bar of the E being the short bar of the 3in T (now an L) and the top bar of the E is the 4in L bracket. Hopefully that makes sense. -Next take 2 1/4 in L corner brackets and drill out one hole at 3/8in for the threaded rod to pass into. These are installed in the rear middle hole of the T that's now an L in the E assembly. This is how you adjust the lower portion of the mount. Since each side is independant, you can adjust for up/down/tilt/left/right/diagonal for the lower portion now. -JB weld it all up so things won't rattle loose except for the parts that are supposed to move for adjustment. -Slide the mount on and thread the eye bolts and now everything should be very solid and ready to adjust. So that's all the hardware. Now on to the electrical! So this I don't think will write up very well but the photos show how it all connects up. With the parts in hand this should make sense for how the board lays out. -I have one wire going to the battery and is fused. This goes into the dash mounted on/off switch, and then the accessory wire of the switch is connected to the positive input terminal of the board. 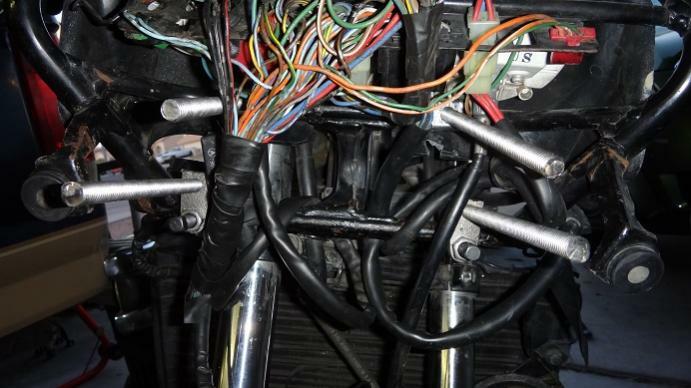 -The negative wire from the on/off switch is wired into the negative of the original headlight bulb socket. -The positive terminal is connected so one prong hits the outside of the three way connectors on the board, and the other two are used for hookup wire going to either side of the board. -The hookup wire on the sides feeds the diodes non cathode (non-striped) side at the two bridge connections on the outside of the board. 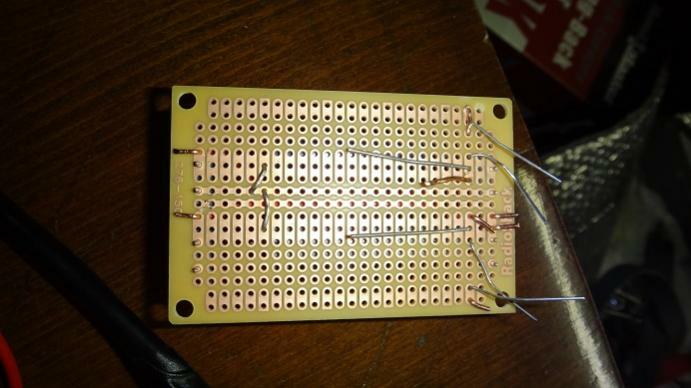 -The diodes then feed the positive terminal of the capacitors separately where the capacitor,hookup wire, and diode share a three bridge connector on the board. 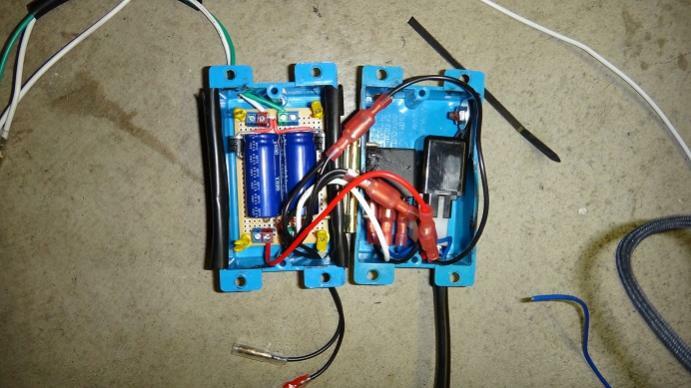 -Connect the positive hookup wire from the positive capacitor/diode connection and feed the terminals on the opposite side using the bridges. -I used one of the center line runs on the board for the negative which bridges the negative terminals on both sides, as well as bridges the negatives of the capacitors. The ballast is now complete! -I painted the terminal connectors specific colors so it's easy to identify. -Next I mounted the board into the 1gang box and mounted the relays in the other 1gang box. Took a lil creativity. -Now wire up the relays so the constant sources is fed from the ballast just built. -I used the relay from the fog lights for lows, and the other relay for the highs but really doesn't matter in the end. The fog light had two output wires so I can consider adding something else in later hence the choice but maybe I want my accessory on high? Your choice in the end. -So now the ballast is built, the relays have power, we just need to turn the relays on an wire the lights in. -This next diode is optional but I think highly important so you can have both beams work together for highs, rather than just one. Your choice. -Keep the diode the original length and bridge the high/low beams together where the headlight bulb used to connect in the three blade style connector. The cathode (striped side) goes to the low beam (white wire/lower/side of connector) so the other end goes to the high beam (blue wire/upper point of connector) The blades from the wiring assembly will keep the diode in place. I recommend making a cap for this as well. -Finally I drilled 3 holes in the Motul jug cap that closely matched the 3 blade head light connector. I pushed the wires/blades through and then ziptied it to compress the wires, diode, and cap into the connector. I finally sealed up the holes with permatex. This should give me a good water resistant seal that can still breath if it gets wet. The cap edges are also aimed down so water can't seep in as is. 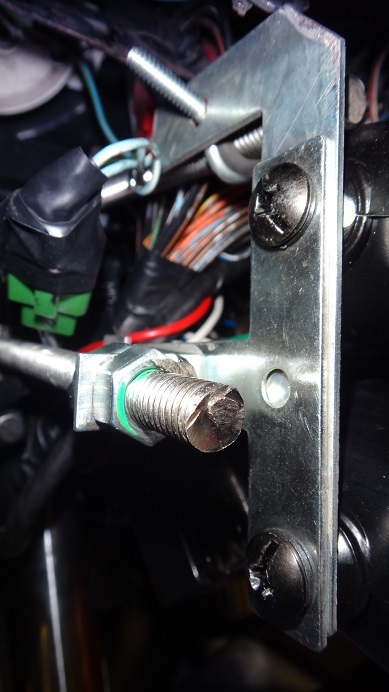 -Now wire one relay switch side to your choice of the high or low beam. Do the same for the other wire. -Join the boxes with the door hinge. -Seal up the holes using the wire cover and you can even cut the wire cover in half and use it to help water proof the box when you close it up and bolt it closed. -Finally wire the lights in picking which will be high and low. I chose the upper for high and the lower for lows. Reason is because I aim the upper more downward to give a higher focus point for the most light distribution for where highs should be which is close, not distant since the idea is to cut through fog with highs and add light to your closer proximity. I chose the lower light for lows because the angle gives more light spread across the surface plane where as using the upper would have a better focus point further away, but washed out in between. -When I first lit this all up, my highs did not work. I thought I screwed it up somewhere but in the end it was just a bad relay. Replaced that and all is well! The images below are kind of the summary of the images/steps. I have a total of 15 images so if you'd like to see the setup in more detail let me know and I'll get them to you. The only lights that work is the headlight! ?